Sofia tours and trips. Tours and trips to Sofia. Tour or trip booking and reservation. SofiaHotels.NET offers a wide range of hotels and accommodation in Sofia. With us you can book various travel services like transfers by shuttle bus or car, transport, car hire services. We also do holidays and vacations in Bulgaria's best ski, beach, rural, spa, golf resorts as well as tours and trips to the most popular tourism sites in Bulgaria – Sofia, Plovdiv, Rila Monastery, Veliko Tarnovo, Koprivshtitsa and all other towns, resorts or villages throughtout the whole country. Please choose your destination or contact one of our friendly consultants now for full support or recommendation. 80 Euro for individual tour for upto 3 persons! For larger group please send us a request. History, Monasteries, Religion, Ancient Sites and Architecture in the Bulgarian towns. Price per person for the whole offer for a group of minimum 15 persons: - 99 EUR per person in double room; - 125 EUR per single room. Price per person for the whole offer for a group of minimum 7 persons: - 139 EUR per person in double room; - 165 EUR per single room. The price includes: - transport services during the whole route; - tour guide during the whole route; - 2 overnights with breakfast included in 3-star hotel. The price does not include: - lunches and dinners; - entry fees. Price per person for the whole offer for a group of minimum 15 persons: - 93 EUR per person in double room; - 110 EUR per single room. Price per person for the whole offer for a group of minimum 7 persons: - 129 EUR per person in double room; - 149 EUR per single room. The price includes: - transport services during the whole route; - tour guide during the whole route; - 2 overnights with breakfast included in 3-star hotel. The price does not include: - lunches and dinners; - entry fees. Price for the whole offer for a group of minimum 15 persons: - 53 EUR per person in double room with breakfast included; - 62 EUR per single room with breakfast included; Price for the whole offer for a group of minimum 7 persons: - 69 EUR per person in double room with breakfast included; - 79 EUR per single room with breakfast included; The price includes: - transport services during the whole route; - tour guide during the whole route; - 1 overnight with breakfast included in a hotel, 3 stars. The price does not include: - lunches and dinners; - chairlift and other entry fees. Free viewing property trip in Bulgaria. Sofia, Bansko, Sunny beach, Varna, Bourgas, etc. Price for the whole offer for a group of minimum 15 persons: - 57 EUR per person in double room with breakfast included; - 63 EUR per single room with breakfast included. Price for the whole offer for a group of minimum 7 persons: - 77 EUR per person in double room with breakfast included; - 87 EUR per single room with breakfast included. The price includes: - transport services during the whole route; - tour guide during the whole route; - 1 overnight with breakfast included in a 3 stars hotel in Kardzhali. The price does not include: - lunches and dinners. Transport from and to Sofia to Koprivshtitsa by car for 2 passengers or a comfortable van for 7. Guide in English. Price for the whole offer for a group of minimum 15 persons: - 47 EUR per person in double room with breakfast included; - 54 EUR per single room with breakfast included; - 52 EUR per person in double room with breakfast and dinner included; - 59 EUR per single room with breakfast and dinner included. Price for the whole offer for a group of minimum 7 persons: - 65 EUR per person in double room with breakfast included; - 72 EUR per single room with breakfast included; - 69 EUR per person in double room with breakfast and dinner included; - 77 EUR per single room with breakfast and dinner included. The price includes: - transport services during the whole route; - tour guide during the whole route; - 1 overnight with breakfast or breakfast and dinner included in Kamilite hotel in Hissarya, 2 stars. The price does not include: - lunches/ dinners; - entrance fees. Price for the whole offer for a group of minimum 15 persons: - 56 EUR per person in double room with breakfast included; - 66 EUR per single room with breakfast included. Price for the whole offer for a group of minimum 7 persons: - 76 EUR per person in double room with breakfast included; - 86 EUR per single room with breakfast included. The price includes: - transport services during the whole route; - tour guide during the whole route; - 1 overnight with breakfast included in a 3 stars hotel in Vidin. The price does not include: - lunches and dinners. Price for the whole offer for a group of minimum 15 persons: - 49 EUR per person in double room with breakfast included; - 59 EUR per single room with breakfast included. - 55 EUR per person in double room with breakfast and dinner included; - 69 EUR per single room with breakfast and dinner included. The price includes: - transport services during the whole route; - tour guide during the whole route; - 1 overnight with breakfast included in a Leipzig hotel, 3 stars. The price does not include: - lunches/ dinners; - entry fees. Price for the whole offer for a group of minimum 15 persons: - 49 EUR per person in double room with breakfast included; - 58 EUR per person in double room with breakfast and dinner included. Price for the whole offer for a group of minimum 7 persons: - 55 EUR per person in double room with breakfast included; - 65 EUR per person in double room with breakfast and dinner included. The price includes: - transport services during the whole route; - tour guide during the whole route; - 1 overnight with breakfast or breakfast and dinner included in Magnolia hotel or Mountain lakes hotel in Panichishte, 3 stars. The price does not include: - lunches/ dinners; - fee for the chairlift about 9 EUR. Transport from Sofia to the Rila Monastery and back by car for 2 passengers or a comfortable van for party of 6 and more persons. Guide in English. Accommodation in rural guest house, rural gourmet experience, Ethnographic and Archaeological museum in Elhovo, the oldest Thracian tombs. 1 person – 147,00 Euro; 2 persons – 99,00 Euro per person; 3 persons – 71,00 Euro per person; 4 persons – 92,00 Euro per person; 5 and more persons – please send us an enquiry. * The prices are in Euro per person and include: 2 overnights in “Kakarovata” guest house; 2 breakfasts; 2 dinners; 1 lunch; guided tour to the town of Elhovo and the village of Golyam Dervent; visit to the Ethnographic and Archaeological museum of Elhovo. Price per person for the whole offer for a group of minimum 15 persons: - 95 EUR per person in double room; - 159 EUR per single room. Price per person for the whole offer for a group of minimum 7 persons: - 134 EUR per person in double room; - 149 EUR per single room. The price includes: - transport services during the whole route; - tour guide during the whole route; - 2 overnights with breakfast included in 3-star hotel; - medical insurance. The price does not include: - lunches and dinners; - entry fees. 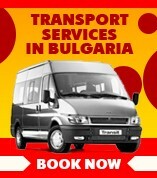 Transport Sofia – Plovdiv - Sofia by car for 2 passengers or a comfortable van for 7. Guide in English. Just wish to say thank you for booking and very comfortable transfer to the hotel. I'll definitely recommend your service to all my friends.